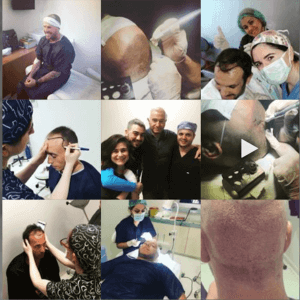 Evocapil products have been observed in preclinical studies that accelerate growth in transplanted follicles after hair transplantation. 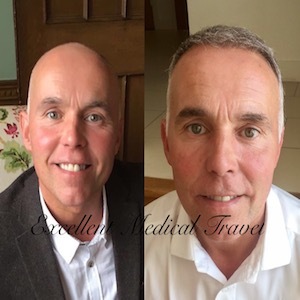 It has shown that it is an effective method, slowing hair loss in the future by prolonging the anagen phase. From the first wash after the planting, irritation of the hair is effectively cleaned, easily rinsed without causing any problems. Since it does contain natural ingredients after treatment, it keeps hair healthy and vital. With a pH (5.5) suitable for deep cleansing of hair and scalp and for maintaining sebum and pH balance of your hair. Can be used for all hair types. contains; Apigenin, Oleanolic Acid, Biotin Tripeptide-1, ProVitamin B5, Vitamin E, Panthenol and Herbal Extracts. It offers treatment support for all women and men who have problems with hair, skin or nails. Contains antioxidant active vitamins and protective minerals, L-cysteine, B12 Vitamin (Cyanocobalamin), Inositol B, J Vitamin, Vitamin H, B3 Vitamin, B9 Vitamin, B5 Vitamin, Zinc, Copper. 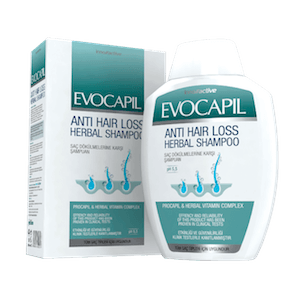 Actual hair growth stimulant Evocapil. The skin spray for the head contains; Apigenin, Oleanolic acid, Biotin Tripeptide-1. 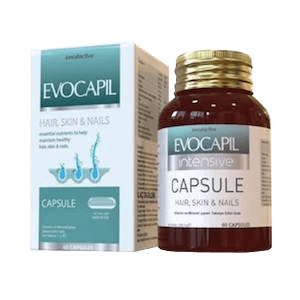 Evocapil AGA treats weak hair follicles and prolongs hair growth. 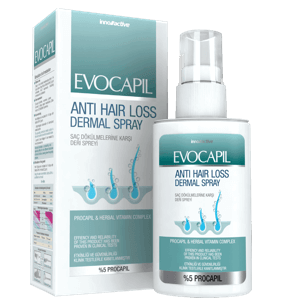 Evocapil Skin Spray is typically used in the long-term treatment of Androgenetic Alopecia. 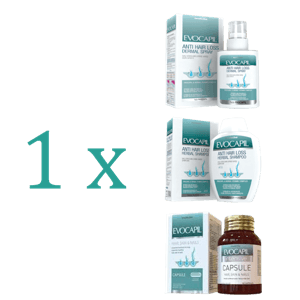 The Evocapil complex for both Men and Women contain the 3 products together. 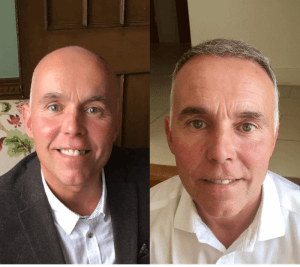 This is all you need for the first 2 months after your FUE hair transplant. The packages are for sale in our hospital and webshop and can be sent abroad to your home country. 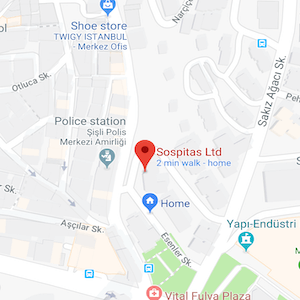 Fill our contact form if you want more information about the possibilities of sending the products to your home address. We can send to almost any country in the world, payments can be done via bank transfer or via Paypal.